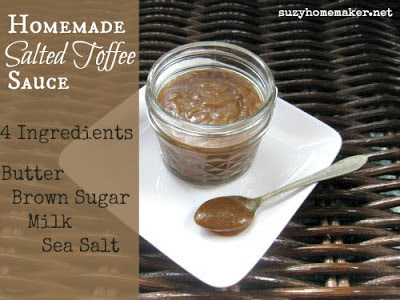 Last week I posted a salted toffee sauce recipe. My recipe only used 4 ingredients. Although I would not consider a sugary toffee sauce a nutritious food, I do think that even with treats there can be better choices. You can see above my ingredients list. 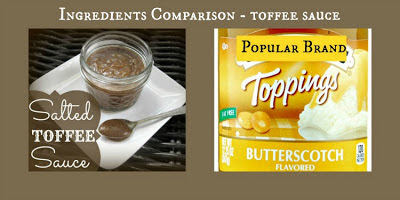 I decided to take a store bought butterscotch sauce and compare ingredients. CORN SYRUP, HIGH FRUCTOSE CORN SYRUP, NONFAT MILK, CONTAINS 2% OR LESS OF: CORN STARCH-MODIFIED, SALT, NATURAL FLAVOR (WITH MILK), SODIUM ALGINATE, DISODIUM PHOSPHATE, SODIUM CITRATE, YELLOW 5, YELLOW 6. If you are trying to decrease the amount of processed foods in your diet, might as well start with dessert! Plus you probably already have all the ingredients to make it.